Moving on from the first part of this series on the Peter O'Connor photograph, we now consider some further objections to this picture. In the previous article, the claimed findings by Maurice Burton to a hoax on the beach were at best found to have more natural explanations and at worst were twisting the data. However, Burton raised further objections which sceptics have continued to promote 55 years on, but, as far as I can tell, have not been subjected to the same level of scrutiny as Peter O'Connor. Firstly, I will give you some background to the event by way of a site visit I did back in 2014. Now, Peter O'Connor had stated that the photo was taken at his campsite one mile north of Foyers. Measuring one mile north of Foyers will not take you where you think you want to be. One mile due north of Foyers actually takes you to the opposite shore near the village of Grotaig. So the assumption is that O'Connor meant one mile north east up the shoreline. That takes you roughly to the spot on this map below. To get to this area, I would normally just walk along the shoreline from the nearest appropriate parking spot on the Foyers to Dores road. However, the road is a long way from the loch here (see map) plus the Foyers Power Station is in the way of a shoreline approach. An attempted approach from the village of Inverfairgaig was considered, but in the end I went for the direct route. I measured a parallel mile along the road which took us to Aleister Crowley's old stomping ground at Boleskine House. When we parked there, you would hardly think it was there, being blocked from view by dense, high foliage. They certainly like their privacy there. So, from here, a descent down to the lochside in as straight a line as possible would take you to about a mile from Foyers. This involved cutting through the Boleskine graveyard and onto an open field. Caution was required here as we had to plough through various high ferns which are a known habitation of ticks, which carry the debilitating Lyme's Disease. Full length clothing and checking for insects after each field was mandatory. Hopping over a fence increased the descent into more wooded territory until we came out on the service road for the Power Station. The shoreline was now in sight as we vaulted another fence into a fairly high gradient descent down more forest. A slip here after rain could see you toboggan on your backside all the way down to the loch (or into a tree)! Finally, the loch broke out into view as you can see from the photograph below. The second photograph below that shows the steep wooded hillside we had just descended. The scene itself was unremarkable in terms of other shorelines we had trudged at Loch Ness. The usual shingle was underfoot with the occasional tree breaking forth from the stones. To the right the shoreline receded towards a headland while to the left, shingle gave way to grass as the power station came into view. I saw nothing which resembled a cliff (if one understands by that a near vertical wall of rock), but I suspect I did not cover a large enough segment of the shoreline and he could have been referring to the high gradient hill behind. Walking on, I came across an old boathouse where I imagined Burton and his team had disembarked from the local man's boat to investigate the scene of the "crime". The first exercise was to see what a photograph of the loch would look like if I crouched to the waist level in water that O' Connor had reported. Being the intrepid investigator that I am, I decided to stay as dry as possible and crouch at the shoreline to the same height. The picture is shown below, but it is of guidance use only since the O' Connor picture shows no background and I am not certain of the field of view in his photo compared to mine. A real comparison picture would use as close to the same make and model as O'Connor at the same time of day and year (with preferably the same weather conditions). A survey of the immediate area did not take long to show up evidence of human activity. Like Burton, I found pieces of plastic sacking, string and a stone circle. Evidently, this is an area which is frequently used for wild camping. Of course, any trace of O'Connor's campsite was long gone. The site of this campfire was just beyond the boathouse on a slightly raised grass area in comparison to the shingle beach. If I had to choose a spot where O'Connor had pitched his bivouac, this would be a candidate. However, my reason for that is purely based on the hunch that campers would rather sleep on grass than shingle. I also say this having no idea whether there was any grass at this spot in 1960 as Burton only talks about sandy, pebbly beach in his letters and book. Also, this area was right beside the boathouse and Burton makes no mention of any boathouse in any books or letters that I have examined. But it is possible that the boat house was built post-1960 as I do not see it in on pre-1960 ordnance survey maps (e.g. map above), but I do see it labelled on a recent map I purchased. It was said to be half-light at 6 to 6:30am on 27 May, yet the sun rises at 4:30am on 27 May in that area. An hour later, even with a cloudy sky, these is sufficient light for photography at short range. 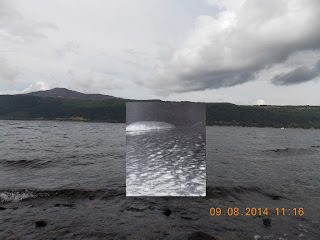 A photographic test performed by Adrian Shine on the same day in 2010 at a point opposite Urquhart Castle using the same camera produced this photo at 0600. Clearly there is a distinct difference in the light levels between this and the O'Connor photograph. So should I go "Ho Hum!" and go silent on this matter? No, let us explore this a bit further. The deduction critics make from this is that O'Connor lied about the time of the photograph for reasons that must have been deceptive. Therefore, the photograph (to quote Roy Mackal) is unacceptable as evidence. But, logically, there is not one but four conclusions that can be made about the time stated by O'Connor. First, that he stated the correct time and it is the photograph that is being wrongly interpreted. Second, he was misquoted concerning the time of the photograph, hence the discrepancy. Third, he stated the time knowing it was not the correct time. Fourthly, he stated the time believing it was the correct time. I will come back to the first option later. The second option is credible as I have seen it happen before in other cases where journalists get sloppy about what they regard as the minor details of a case such as date, time, location, distance, etc. They may be minor to them, but they are important to Loch Ness researchers. One case that springs to mind was the recent Jon Rowe photo where the Inverness Courier got the time wrong by about four hours. However, I do not think this is applicable here as Tim Dinsdale quotes a letter from O'Connor stating a time between 0600 and 0630. Other sources close to the time also give this time window. The third option is the sceptics' position and it is a speculation which involves wilful deception on O'Connor's part. This naturally leads to an important question, why would he lie about the time? If the picture was taken about two hours earlier, why not just state that time? What is the problem with doing that? After all, surely O'Connor knew what the light levels were like at that time of day having camped there for days previously? Why make yourself a bigger target for the critics on publishing the photo? The only reason offered is so that O'Connor and his accomplice could deflect from the scenario of setting up the hoax in complete darkness with no one around to see them. But why would that cause O'Connor to lie about the time? Why can't you set up a hoax at 0400 and still state the event as happening at 0400? The rather insipid reply comes - so that he would not be charged with setting up a hoax in the dead of night. But surely he would be opening himself to a worse criticism by stating a time between 0600 and 0630? It seems you're damned if you do and damned if you don't. If the claimed motive for the claimed deception is weak, then so must be the deception. There is no point in stating a crime without a motive. I await a better reply from the critics of this photo regarding this supposed motive. I think you would agree O'Connor is quite accurate in his times here. The second sighting took place on the 3rd July 1960 and is stated to have occurred at 1000; again no uncertainty or resorting to time ranges. So why the uncertainty about times concerning the photograph? If he was the consummate liar of the sceptics, why not just state a precise time as with the other cases (indeed, as an alleged liar, why not jazz up those low grade sightings while he was at it)? If O'Connor's critics feel at liberty to speculate on his motives and actions, then I think I have the right to do so as well. It is clear to me that O'Connor did not attempt to estimate the time of the sighting until after the event. If he had checked his watch when he first got out of the tent, he had a time reference for all that followed. More likely, he just got out of his tent without bothering to check the time. Once the high tension and excitement of the event had got a grip on him, I doubt noting the time was high up on his list. The longer he put it off, the bigger the chance he had of getting it wrong. Of course, this is all speculation, just exactly as the sceptics' arguments on this point are. Choose your bias and make your choice. However, putting theories about times aside, there is another factor in all of this that has not yet been taken into account. Adrian Shine's photograph was taken in the area of Whitefield; Peter O'Connor's was taken in the area of Boleskine. Why is that significant, you may ask? The answer is that it is likely that at between 0600 and 0630, the sun had not yet risen on Peter O'Connor due to the higher terrain behind him. If, as I did, you actually visit the site of the photograph, the problem becomes clear. There is a large rising gradient from the shore to the B852 road. You actually cannot see or hear the road from the shore as it is hundreds of metres away and high up. At Adrian Shine's test location, the road is very close and there is no overhanging hill behind. Let's do some calculations here. Using the average time of 0615 on the 27th May 1960, the direction (azimuth) and height (elevation) of the sun can be calculated. We get the pictures below with the sun's elevation at 10.18 degrees. The yellow line shows the azimuth of the sun at 66 degrees from north. Consulting an ordnance survey map, we can estimate the various contours of the land along the azimuth and calculate whether they obscure the sun or not. For example, there is a 210m contour near the summit of Tom Na Garbhachd, about 1300m along the azimuth from the O'Connor site, but (typically of more distant peaks), this yields an angle of incidence of about 9.2 degrees, low enough to let the sun peek over its summit at an elevation of 10.18 degrees (and taking into account the sun's angular diameter of half a degree). That situation changes when we consider the angle of incidence at the roadside near Boleskine House. According to the map, the road is about 93m above sea level. Since Loch Ness is 16m above sea level, we need to deduct this from the height to get 77m above the loch. The distance along the azimuth from road to shore is 375m to which we apply a simple trigonometrical formula to get the angle of the roadside hill as 11.6 degrees, or 1.4 degrees higher than the sun. Obviously, if a hill is obscuring the sun, then a shadow will be cast. Since the elevation of the sun at 0615 was 10.18 degrees, that shadow length can be calculated via some more trigonometry. This gives a shadow length of 428 metres. Subtracting that part of the shadow that is within land (375m), gives us a shadow over the loch where Peter O'Connor was of 53 metres. However, we can do better than that. A closer look at the map reveals a high contour further down the hill of 70m (according to sheet 416 of the OS Explorer Map series). That summit can be seen on the map below, marked with a star symbol. Measuring along the line of azimuth takes it just past the peak at 0615 with a distance of 200m from peak to shoreline. However, the sun would have been just behind this 70m summit not long before. Applying the triangles again gives us an angle of incidence of 15.1 degrees, or nearly 4 degrees higher than the sun's elevation and a shadow length of 300m. Subtracting the 200m of hillside from the total shadow length gives a shadow on the loch of 100m. If the hill angle was 15.1 degrees, the sun would not rise on Peter O'Connor until about 7am. Maurice Burton implied O'Connor was a liar when he said he took the photograph in "half light". From these calculations, it appears that O'Connor was indeed in half light courtesy of a hill behind him obscuring the sun and casting a shadow 100 metres beyond his position. Gentle reader, if Peter O'Connor was truthful about this matter, what else was he truthful about? This raises questions about the usefulness of Adrian Shine's site further north. That study said test photos were taken to determine light levels, but it is clear that these pictures are useless in making a determination of light levels are they were not in 100m shadow. Another trigonometrical look at the contours along the azimuth at the Whitefield site gives a clear line of sight to the sun and no hill obscuration (for the mathematically minded, these were sightings taken at height/distance/angle triplets of 244m/2100m/6.6, 92m/1500m/3.5, 448m/2600m/9.7). Furthermore, the increase in darkness makes the role of a flashbulb more important, but no flashbulb was employed in the Shine experiment. In consideration of these facts, the photos taken at Whitefield cannot be considered as evidence in this matter. But leaving these matters aside for the moment, what about the dark background of the photograph? Surely some detail should have been visible of the opposite side? First of all, the photograph is undoubtedly cropped. In fact, just about every monster picture that appears in newspapers are cropped so that the object of interest fills as much of the print image as possible. The Surgeon's Photograph is a prime example as you can see below (indeed, some publications zoom in even more than this). Applying the same criteria, we can see how the picture editor would have chopped out the sky to leave just darker hillside, as shown by the following overlay. As guidance, I use the photo I took at the site kneeling down to O'Connor's stated height when he took his picture. The ratio of sizes is consistent with those of the Surgeon's Photo. 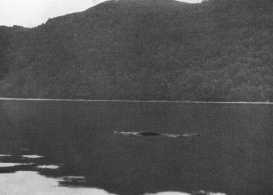 Considering the dark background further, we have another photograph taken of the Loch Ness Monster that enjoyed similar circumstances to that of Peter O'Connor. I am referring to the Lachlan Stuart photograph. Both claimed to have been taken around 6:30am and sunrise for both occurred about the same time (0443 for the Stuart photo). Looking at the photo we also see a rather dark, featureless hillside. Zooming into the hillside on the left gives us this picture below. I think you would agree there is not much to pick out (by the way, someone on facebook is going to auto-disagree with the use of this picture, I'll address that in the comment section - if they regurgitate). Two further points are worthy of consideration, though they can be neither proved or disproved by sceptic and non-sceptic alike. Firstly, did the picture editor alter the brightness on the picture, thus making the background darker? This has certainly been done on other monster pictures and no one denies this to be the case. None other than Sir Peter Scott conceded this may have been done to this picture. However, without the original, uncropped, unedited photo, nobody can say either way. Secondly, the weather conditions at the time of the O'Connor photo are not stated. One possibility is that a haar rolled down Loch Ness from the sea. Their effect can be very obscuring as these two pictures from 2014 show. Again, nobody knows whether such a fog was present or absent on that May morning in 1960. Dinsdale, who at first accepted O'Connor's story and published it, removed it from subsequent editions of his book after Mackal and Witchell had expressed doubts. In fact Mackal has rejected it as evidence. Dinsdale has told me that his subsequent omission of the photo resulted from O'Connor's attitude; upset by public criticism and ridicule of charges of fakery, O'Connor wanted to be left in peace. Dinsdale remains inclined to believe that the photo could really be of a Nessie. This is a reasonable question, but there is a perfectly simple answer to it, and it is vital that it should be understood. As every photographer knows, the human eye and a camera are not the same thing at all, and a scene that may appear fairly bright to the eye can be as black as pitch to the film in a camera, if the settings are wrong. Correct film exposure is dependent primarily on three things—shutter speed, lens aperture, and film emulsion speed. If the aperture is too small for a given light intensity, the film will appear under exposed, or black. 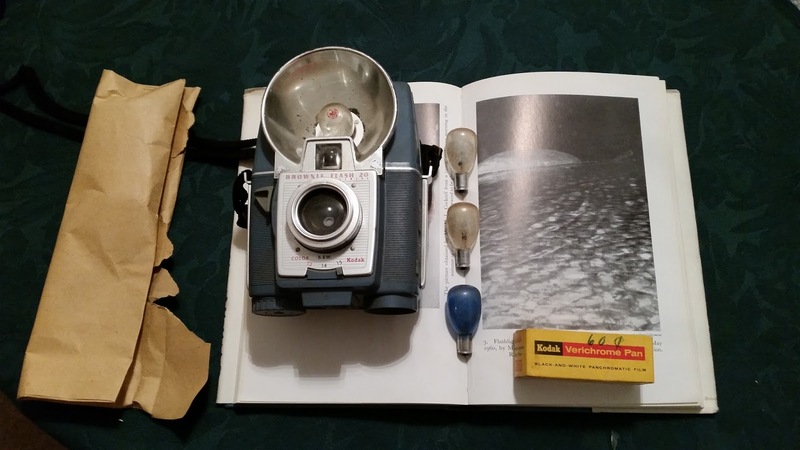 Now, Peter O'Connor's small and inexpensive camera was set at an absurdly small aperture, f.14, for the limited intensity of light one could expect at this time of year at 6.30 a.m. I know this is so because I took dozens of light meter readings at about the same time in the morning a few weeks before the event, on the shore of Loch Ness; in conditions which, to my own eye, seemed bright enough, and I know that for the combination of film and shutter speed at his camera, an aperture of f.14 was completely inadequate; and that the film would, in consequence, be grossly under exposed. I took some pictures myself in 'perfect visibility' at about this time at f.2.8 which is a far larger aperture—and the results are barely discernible. The reason why the human eye is so deceiving in terms of judging actual light intensity, is because it is such a marvellous automatic mechanism. The iris of the eye opens wide when light is poor giving the maximum light to reach the retina. The result is that the observer remains unconscious of even large degrees of changing light intensity—whereas the camera aperture is fixed at whatever setting is chosen. And if this is too small the film gets too little light and the image appears dark or black. The second important thing about the picture is that Peter O'Connor used a flash bulb on his first successful picture of the Monster, and not on the second. In the first the Monster is highlighted, but the background remains black because it is out of range of the flash; and in the second the whole picture is a failure: completely black. This is all quite straightforward. People who have taken flashlight pictures out of doors in bad will recognize the black or underexposed background at once. It is inevitable, and explains the peculiar 'middle of the night' appearance. The Brownie Flash 20 camera I possess actually does not allow such fine tuning of the lens aperture and shutter speed. It has three settings - EV 13, 14 and 15. Dinsdale was confusing this 14 with an f/14. However, at a shutter speed of 1/50s and a film speed of 200, we're talking about f/18 using an EV calculator. I would liked to have seen Dinsdale produce examples of these poor light pictures, but I guess publishers like to focus on the more sensational pictures. I agree with his assessment in this regard, it is now a matter of reproducing the conditions. The main thrust of this article concerns the lighting in this photograph. A test picture taken in 2010 suggests a problem in the time O'Connor deceptively or unwittingly gave. Further calculations suggest this test picture has its own problems to address. If O'Connor did indeed take his photo in the half-light of shadow, then the flashbulb becomes a factor in the investigation. And if the flashbulb becomes a factor, then the object which reflected its light back into the camera becomes a factor too. Neither of these were used in the 2010 test picture and the test is thus invalid. The solution is to go to the actual site and take a series of photos with flashbulbs and a suitable object in the water. It would also be necessary to find the correct time that best reproduces the O'Connor photograph. The only unknown would be the weather conditions at the time. That is what has to be done. As you can see from the above picture, I have the same camera as O'Connor, along with original flashbulbs and film (whether they still work is another matter). What I do not have is a suitable object to reflect back the flashbulb light with an albedo similar to O'Connor's monster. It is now a matter of going to Loch Ness and getting the job done properly. The next instalment of this series focuses on some other less important objections and theories concerning the picture, including the strange case of the O'Connor canoe. So 2016 has started and the usual plans are afoot for trips to Loch Ness and exposing the fallacies of sceptical pseudoscience and half baked arguments. These are the articles I plan to at least put out this year. Of course, others will follow as this article now brings the blog total to 452 articles! At least two more articles on this controversial photographs are to follow. If the sceptics jump up and down enough, a fourth may follow. If they scream, maybe a fifth! 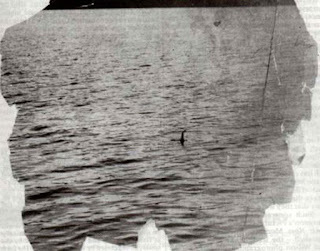 Between 1933 and 1960 we had what is known as the classic Nessie photos. 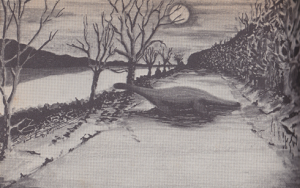 Those black and white pictures from Hugh Gray to Peter O'Connor were the staple of many a Nessie book. I think Hugh Cockrell's is the last one I need to cover (and that is after five years of blogging). So it is well overdue an article that does it justice. The sceptics have been dissing this famous 1934 case for years now. It's time to see if they can take it as well as dish it out. A follow up article is planned for this famous picture gathering up my thoughts and further finds since I last wrote on it. In fact, I even plan to play the part of a sceptic in this one! When I first pointed out the fish like head in this picture, the best a leading sceptic could come out with was that he could see Elvis in the picture too. Real sharp thinking there. It didn't get much better after that. It's time for a revisit and new insights into this important photograph. A famous film, but only Maurice Burton saw it as he selfishly kept it to himself. Now we only have scraps, but I hope to add to the stock of knowledge this year. If I find it between now and then, I will be as excited as anyone. That's it, but there will be more than this as we look forward into the 83rd year of the Loch Ness Mystery!